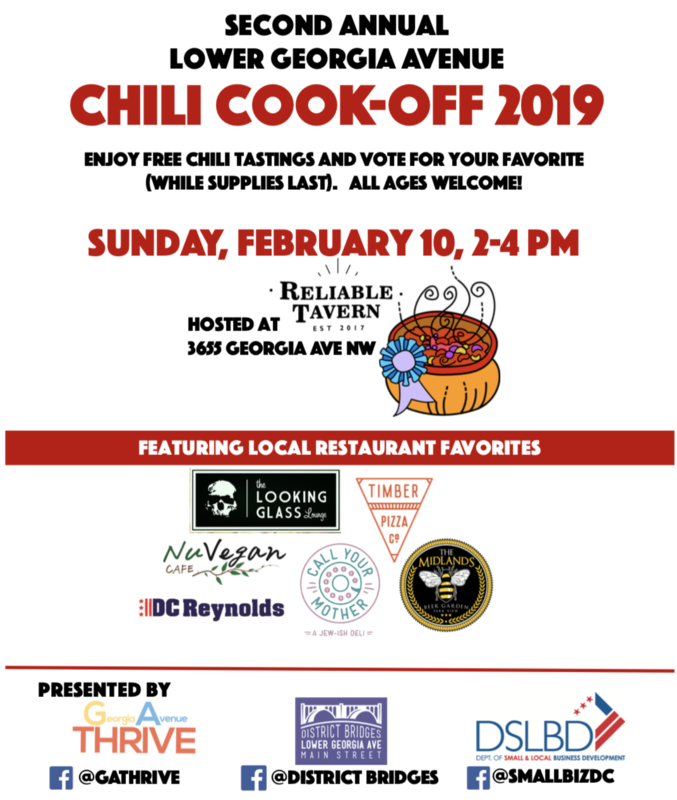 2nd Annual Lower Georgia Ave Chili Cook-Off is This Sunday at Reliable Tavern | Park View, D.C. The 2nd Annual Lower Georgia Avenue Chili Cook-Off will be at Reliable Tavern this Sunday from 2-4 pm. Come out, meet your neighbors, and enjoy FREE chili tasting from some of Lower Georgia Ave’s favorite restaurants’ chefs! These tasty dishes aren’t on the menu as each entry is prepared just for this one-time event! I’ve been informed that this is a family-friendly event and all ages are welcome. Reliable Tavern will be hosting this event in their basement (stairway entry). Featured restaurants are DC Reynolds, The Midlands, NuVegan Café, The Looking Glass Lounge, and a mash-up with Timber Pizza Company & Call Your Mother Deli. This event is organized with the support of Georgia Avenue Thrive, District Bridges’ Lower Georgia Ave Main Street, and the DC Department of Small and Local Business Development. This entry was posted on February 7, 2019 at 10:01 am and is filed under Restaurants Bars & Taverns, Small Businesses. You can subscribe via RSS 2.0 feed to this post's comments.